Then select the "Frequency" tab. 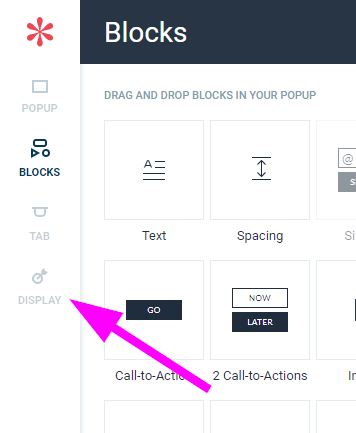 The "SHOW AGAIN" section allows you to set how frequently you want your popup to appear. If you select "On every page", the popup will display every time users match your targeting conditions. Let's say your popup is set to display on your homepage and on your contact page. If visitors view both pages, they will see your popup twice. 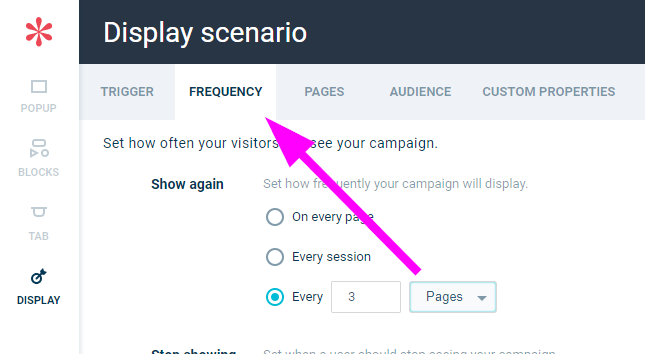 If you select "Every session", your visitors will see your popup once for every navigation session (in other words, they will have to leave your website and come back on it to see it again). If they visit the homepage and the contact page, they will only see your popup on the first page they visit. Note: the definition of session varies depending on your browser. For example, for Chrome a session lasts 2 hours. If you select "Every X", your visitors will see your popup x times / pages depending on the chosen interval. If you select never, your visitors will see your popup every time they match your targeting conditions. Pro tip: display scenarios take one minute to go live once you have saved them.